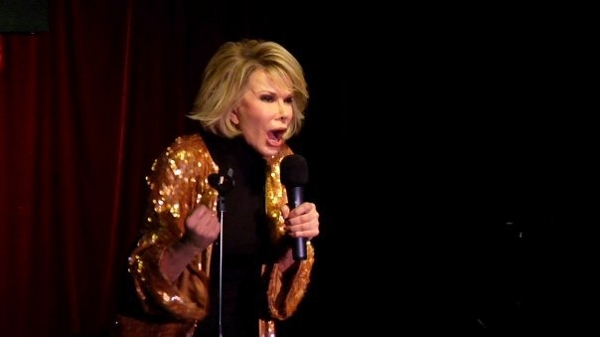 Over the past 40 years, Joan Rivers has overcome monumental obstacles and continues to lead the fight for female comedians worldwide, but, as is the reality of show business, no one stays on top forever. In this riveting one-year peek into the private life of an actress/comedian/writer/mother/grandmother/friend, the audience is given the opportunity to witness Rivers’ vulnerability and constant fear of opening her schedule book and seeing nothing but a blank page. As the year progresses, the workaholic exposes her relentless desire for continued success as she tours with her self-scribed theatre production, appears on NBC’s Celebrity Apprentice with her daughter Melissa, and performs her stand-up routine in various clubs around the country, both seedy and reputable. Directors Ricki Stern & Anne Sundberg tastefully infiltrate the disheartening and encouraging sides of Rivers’ past and project the talented artist as an inspirational yet levelheaded subject. At 75-years-old, the crass comic can still keep up with the rising comedians of today, and then some, but it’s her personal hardships, shrewd outlook on life and devoted family relationships that make her standout amongst the crowd.